The students in Year 8 have been investigating how climatic hazards occur. The focus has been on hurricanes as it is currently ‘hurricane season’. The students have explored the devastating impact that hurricanes can bring to an area and whether we can ever truly be prepared for such an event. To show their understanding the students created a newspaper report on a hurricane of their choice. Examples of their work can be found below. The Year 8s have been investigating weather and how the different conditions occur. For part of this they were asked to investigate a type of wind that impacted us in Geneva. The students then created a poster to explain how the wind was formed, what weather conditions were brought to the area by that wind and how it may impact us. Examples of their posters can be found below. The students in Year 8 have been investigating the different weather conditions and how they occur. For this assignment the students were asked to work in teams to explore which factors impacted temperature. They then presented their findings to the rest of the group. Examples of the presentations and photographs of them working can be found below. Year 8 students are currently studying about climate and weather, and how human actions affect and are affected by these phenomena. 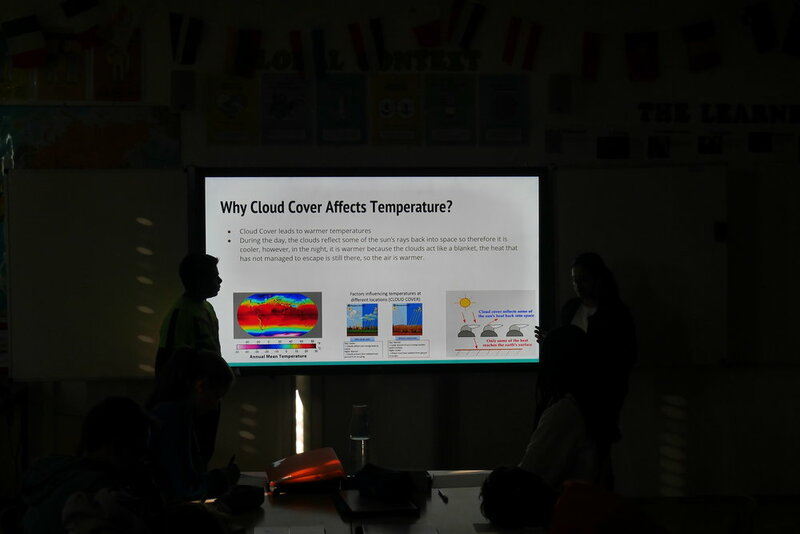 Recently, students have been researching about factors which influence aspects of the weather and have been presenting their findings to their fellow students. For the final unit in I&S the Year 8s are exploring Africa as a continent. They have currently looked at the physical diversity and now they are investigating the cultural differences across the continent. To start this off the group were divided in to teams of 2 or 3 and were asked to explore a specific indigenous group using a set series of questions and resources. The teams created google slides to share their knowledge with the whole class. Below are a series of photographs showing the group presentations and the slides they created.